Chinese diplomacy under the new leadership is being closely watched and discussed by political scientists and scholars around the world. The Chinese and Russian leaderships have seen increasing bilateral cooperation both economically and politically in recent years. How will these relations develop? What challenges remain ahead of the two largest emerging powers? The RIA Novosti news agency invited analysts from both countries to debate these issues after China's leadership transition at the 18th National Congress of the Communist Party of China. Despite the change in leadership, China's foreign policy will maintain its previous role as serving domestic economic development. China has "three rings" of diplomacy. The first ring is sound relations with big powers; the second is friendly ties with its neighbors; and the third is all-round cooperation with other developing countries. Russia is the only country that falls into all three rings. Some foreigners are skeptical about China's economic model. They believe China is facing greater and greater risks of economic collapse, mixed with severe corruption problems. But we must realize there is also great potential to bridge the development gaps between cities and the countryside, and between western and eastern parts of the country. China's domestic consumption demand has yet to be unleashed. China's and Russia's leaderships also have reached a target to bring the bilateral annual trade volume to $100 billion in 2015, and then double it by 2020. Although the figure is incomparable with the current China-US trade volume of nearly $450 billion a year, it remains an ambitious goal, given the current weak state of China-Russia trade. A precondition for this to succeed is a stable environment for sustained economic growth in China. Russia will undoubtedly benefit from this. China now faces security threats from three sides: east, south and west. The only secure side is north thanks to good relations with Russia and Central Asian countries. The Shanghai Cooperation Organization (SCO) should play an active role in Afghanistan, when US-led NATO troops withdraw in 2014. A group of Russian experts have carefully examined the report that Chinese leader Hu Jintao made at the 18th Party congress. We noted China's ambition to build a wealthy and strong socialist country by 2049. China's strategy is based on harmonious development and friendly relations with neighboring countries. In multinational arenas such as the UN Security Council, G20, SCO, and the BRICS, China and Russia have found more and more common interests. China has realized that Russia, which has settled its territorial issues with China, can be a very good partner in these occasions. But economic cooperation between China and Russia has apparently fallen behind political cooperation. While China applies the brakes to its economic growth rate, it will be no easy task to double the income of Chinese people by the end of this decade. What's more, the middle class in China, benefiting from the transition of economic development model, will continue to grow up and demand more political representatives. This will happen as the grass roots in China are becoming increasingly averse to corruption. Externally, the US will not loosen up its containment of China, and the expanding China-US exchanges will not only let the two become more interdependent, but also bring more potential frictions. Russian President Vladimir Putin has made it clear in his foreign policy statement that China's economic development is a historic opportunity for Russia. But there have been negative thoughts emerging in Russia recently. Some people see a stronger China as a threat, and they believe China erodes Russia's interests in Central Asia by developing ties with ex-Soviet republics there. When China and Russia were hostile to each other in the 1960s, both lost opportunities to develop economic ties, setting them back decades. Now, the leaders from both countries have renewed this focus. Russia has set itself the goal of increasing its per capita income to $35,000 in 2020. Even if China doubles its people's income by that time, the Chinese per capita income will only stand at $10,000. 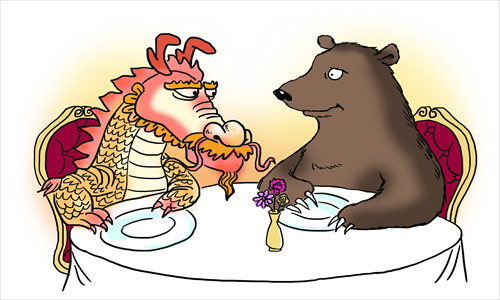 China does not pose any economic threat to Russia. In political governance, China and Russia could also find a way to share their experience in fighting against corruption. And internationally, the two countries share the common responsibility to avoid a new imbalance in Asia-Pacific, preventing hot disputes from souring into real conflicts.